As energy efficiency continues to gain attention as a key resource for economic and social development across all economies, understanding its real value is increasingly important. 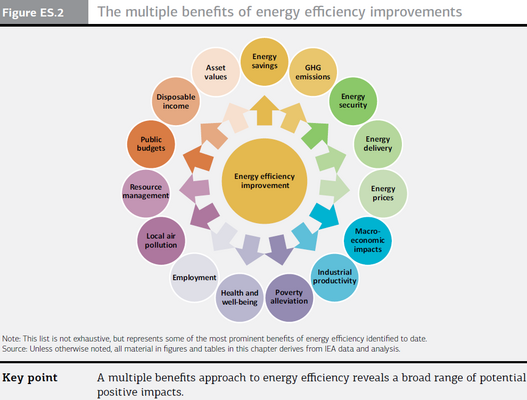 The multiple benefits approach to energy efficiency policy seeks to expand the perspective of energy efficiency beyond the traditional measures of reduced energy demand and lower greenhouse gas (GHG) emissions by identifying and measuring its impacts across many different spheres. The term “multiple benefits”1 aims to capture a reality that is often overlooked: investment in energy efficiency can provide many different benefits to many different stakeholders. Whether by directly reducing energy demand and associated costs (which can enable investment in other goods and services) or facilitating the achievement of other objectives (e.g. making indoor environments healthier or boosting industrial productivity), recent research acknowledges the enormous potential of energy efficiency. This publication demonstrates its role as a major contributor to strategic objectives across five main themes: enhancing the sustainability of the energy system, economic development, social development, environmental sustainability and increasing prosperity. two-fold: to build knowledge and understanding of the nature and scope of the multiple benefits of energy efficiency, and to provide practical guidance on how to apply policy development and assessment tools to account for these impacts. The combination of theory and practice will help policy makers and other stakeholders to integrate multiple benefits into strategic planning in order to maximise the potential for positive outcomes. Energy efficiency is taking its place as a major energy resource in the context of national and international efforts to achieve sustainability targets. This reflects a paradigm shift that is beginning to give credence to actions on both the supply and the demand side in the quest to achieve economic growth while supporting energy security, competitiveness and environmental sustainability. In effect, attention to energy efficiency has begun to evolve, progressing from the lack of visibility inherent in its identification as “the hidden fuel” (i.e. measured and valued only as the negative quantity of energy not used) to an increasing recognition of its role as the “first fuel”. Energy use avoided by International Energy Agency (IEA) member countries in 2010 (generated from investments over the preceding 1974 to 2010 period), was larger than actual demand met by any other single supply-side resource, including oil, gas, coal and electricity – making energy efficiency the largest or “first” fuel. Aggregate annual investments in energy efficiency have been estimated at USD 300 billion in 2011, which is equal to aggregate investments in coal, oil and gas power generation. Macroeconomists have stated that energy efficiency is the surest energy supply that exists. 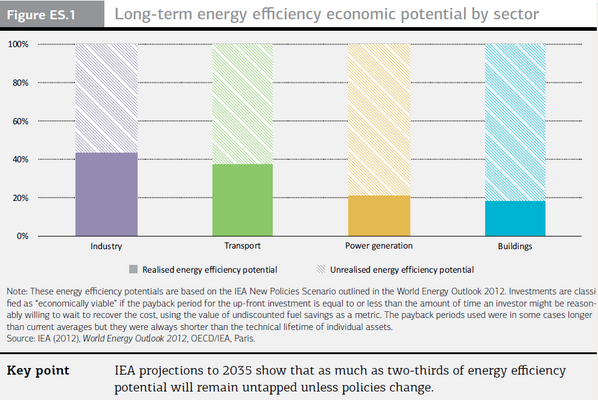 Harnessing economically viable energy efficiency investments would facilitate a more efficient allocation of resources across the global economy, with the potential to boost cumulative economic output through 2035 by USD 18 trillion – larger than the current size of the economies of North America combined (namely, the United States, Canada and Mexico). Energy efficiency has also become a pillar of global development goals, including the United Nations Sustainable Energy for All initiative. In the face of rising energy demand, global growth aspirations and the pressing need to limit GHG emissions, the market for energy efficiency could develop rapidly – provided that stakeholders understand its value. that under existing policies, the vast majority of economically viable energy efficiency investments will remain unrealised (Figure ES.1). Many barriers contribute to the limited uptake of energy efficiency opportunities; 2 one main obstacle is the lack of attention paid to energy efficiency investment opportunities by stakeholders in both the private and government sectors relative to supply-side opportunities, including new resources such as shale gas and oil. The multiple benefits approach seeks, in part, to address this barrier by rendering more apparent the benefits that energy efficiency can generate for these stakeholders. It also helps to address the challenge of the invisibility of energy efficiency (i.e. representing energy not used), by appropriately crediting it with the value of the positive impacts it triggers across a variety of areas. 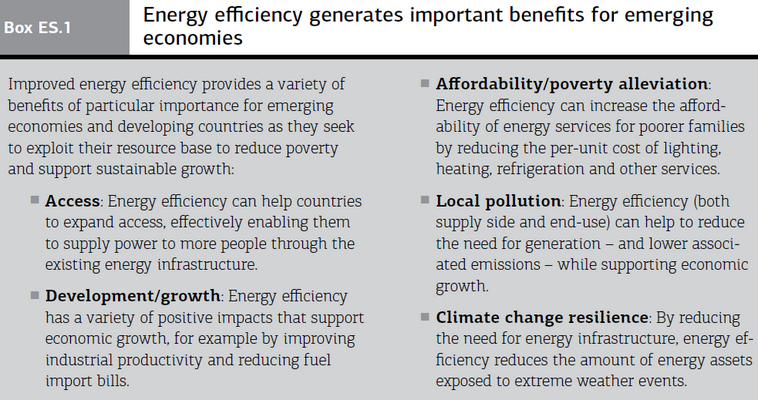 Research has brought to the fore a range of areas, beyond energy demand reduction and lower GHG emissions, in which clear benefits of energy efficiency have been documented (Figure ES.2). Most of these benefits are relevant to IEA member countries and nonmember countries alike, although prioritisation by individual countries is likely to vary. Experts increasingly acknowledge the important role of energy efficiency in generating a broad range of outcomes that support ambitions to improve wealth and welfare – goals that the public and policy makers both understand and aspire to achieve. To date, these broader impacts of energy efficiency have not been systematically assessed, in part due to a lack of critical data and the absence of mature methodologies to measure their scope and scale. As a result, the degree to which energy efficiency could enhance economic and social development is not well understood, and generally considered in national policy decision-making processes only in a qualitative way, if at all.